Look at this photo. Imagine approximately 130 F heat. Picture yourself running. How far would you be able to go? Well, some people manage to run 135 miles. 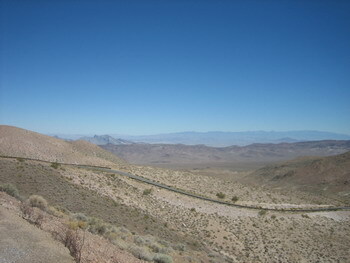 Yes, the Badwater Ultramarathon is on (7/14 – 7/16/2008). Without questioning myself why one would want to run 135 miles in Death Valley and beyond, I must admit that to endure this race is … awesome. I have no other word for it. Right now the first participants have reached the goal. The fastest time was 23:20:16. Anybody completing the race in under 60 hours receives a medal, those who need less than 48 hours a belt buckle. No prize money is awarded. I’ve been to Death Valley and hiked through Zabriski Point. It was later in the year, with temperatures somewhat cooler (only approx. 115 F). Even with plenty of water and at a moderate hiking pace it was hard going, very hard, but in the end I felt proud and elated that I did make it. I imagine that this it exactly the feeling one has after doing 135 miles – only a hundred times more so.